Do you want to enjoy Seattle like a local, without having to struggle, and pay, for parking? This is a full equipped and well-appointed 2 Bedroom condo in Seattle's fashionable Belltown district, so close to everything you don't need a car, or if you are bringing one anyway, parking is FREE! Seattle Oasis Vacations presents fully equipped 2 Bedroom vacation rental condo in Seattle's fashionable Belltown district. These luxury accommodations are perfect for up to 6 guests. 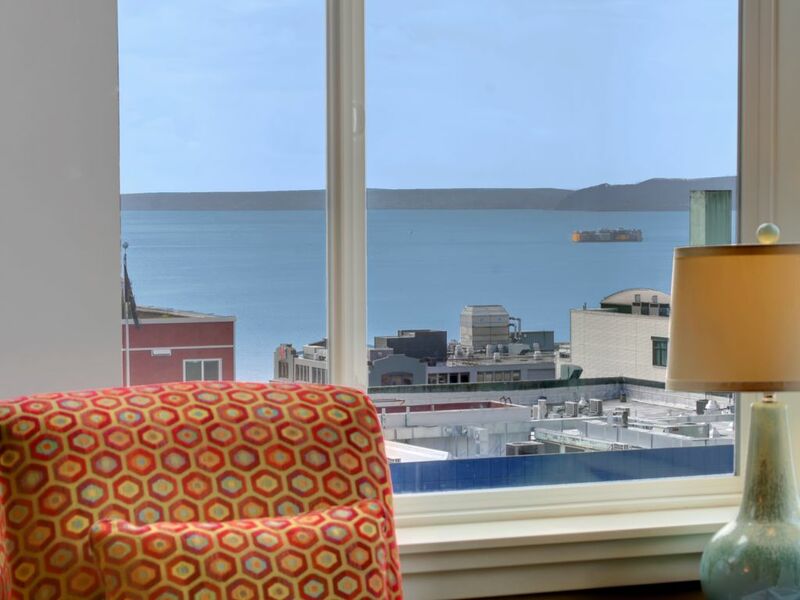 Incredible views of both Puget Sound and the majestic Olympic Mountains and all of Downtown Seattle are available from nearly every window and from the balcony. Finished with marble, Washington state granite, a designer stainless steel kitchen and remarkable living space all combine to offer one of Downtown Seattle's most desirable vacation or business rental locations. 2 flat-screen HDTV's and wireless internet throughout make it the perfect spot to meet a client or to enjoy all the comforts of home during your visit. Truly luxurious sleeping accomodations mean you can rest even during a demanding business trip or an action packed Seattle vacation. Just blocks to the famous Pike Place Market, Seattle's Space Needle and the Seattle Center, local transportation is right outside your door. With secure parking on the premises, there's also a beautiful full sized swimming pool, hot tub and sauna. Please be aware that A/C is provided via a window unit during summer months (almost NO buildings-less than 5%- in Seattle have central air conditioning). Also, be aware that this is a urban environment. In any urban core, you can expect to hear street noise, often late into the evening. If a silent outdoor environment is important to you, downtown Seattle (or any big city for that matter) may not be the best place for you to stay. That being said, this unit in the heart of Seattle, and has high quality, noise muffling windows and heavy duty construction. Any questions about this, ask! We want our guests to be happy. From the living room of this beautiful property you will have a view of the Puget Sound. A landline phone is available in the condo, with domestic calling for free. Condo is outfitted with portable air conditioner unit during summer months. Installation is dictated by local temperatures. We also provide fans, and windows in this condo are operational. High thread count sheets, extra blankets and pillows are available in the condo. Parking clearance is 6'8'. Please ask if you are unclear about a large vehicle fitting in this urban parking garage. We are not responsible if your car doesn't fit. Condo has its own router, with high speed internet. Fitness room is available 24 hours. Quiet hours (TV on mute) between 11pm-6am. Please obey all posted rules. Spices, salt and pepper, and olive oil available for each guest. Dish soap and laundry detergent are also provided. We also provide a 'starter' supply of paper towels and toilet paper. Sit down dining for four around dining table. High chair available upon request at a flat rate rental. Many of our properties have DVD/Blu Ray players installed. However, for those that don't, we do have a DVD/Blue Ray you can rent for a flat rate for your stay. Kayak rentals and tours are available locally. Ask for details! There are no facilities, other than the condo itself, for bike storage. However, there are several bike rental and bike tour companies in the area. Ask for details. Pool is open 5am to 11pm. Pool is owned and maintained by building management. We cannot control closures due to maintenance or health issues. Please obey all posted rules. Hot tub is open 5am to 11pm. Pool is owned and maintained by building management. We cannot control closures due to maintenance or health issues. Please obey all posted rules. The condo was very tidy and spacious for being so close to all the sights of Seattle, not to mention a water view. Decor was kid friendly, only a few things needed to be moved to accommodate our active child. Very nice gym and amenities like a pool. Close proximity to several tasty restaurants and the sights of Seattle including Pike's Market, the waterfront walk, aquarium, space needle, etc. Lastly, parking was INCLUDED! This is huge in any big city. We're incredibly happy to know that our condo, its location and amenities worked best for you, Alisa! Thank you for mention them in your review! Can't wait to welcome you and your family again sometime soon! Well located -- easy walking distance to many attractions and restaurants -- and well designed and equipped. Had all we could have wanted and more. We stayed in the Belltown Towers for our spring break trip to Seattle and we loved it. It’s the perfect location for all the Seattle sites. It’s about a ten minute walk to the Space Needle or museums, ten minutes to Pikes Market. With that, it’s a little loud outside and street noise can be a bit much. The condo was very clean and had everything the four of us needed. We were a little bummed out that the pool was closed during our stay, but the kids weren’t too disappointed. All in all, it’s a great place! We apologize for your inconvenience about the pool, Eric. Should you visit Seattle again next time, please consider to stay with us so we could make it up and give you 5 star service. Thank you for your kind review and for staying with us! March in Seattle - YES! If you're looking for a great location in Seattle, near the Public Market, near the attractions, with parking included in your rental - then THIS is the place! Perfect location to walk to the space needle, market, quick Lyft ride to the Underground Tours, and plenty of restaurants right nearby. We felt welcomed, local, and truly enjoyed our stay in Belltown area of Seattle. The rental service was excellent to work with, friendly and on top of it all - communication every step of the way before, during and after. The place was clean, and inviting. Would return in a heartbeat! Thank you for writing us a wonderful review, Joann. Hosting a hassle-free guest like you was really a great honor! We'd love to welcome you back anytime soon! We had a lovely time at this condo! I stayed here with 4 friends for our annual Oscar party retreat! It was the perfect location, as we could walk everywhere and leave my car safely in the private garage. I wouldn’t hesitate to stay here again! And you're a pleasure and respectful guest your self, Jennifer! Please bear in mind that you are so much welcome to stay with us again anytime you're in Seattle. Thank you for the review! This condo is perfectly placed to get all the must see sites - Pike's - The Needle - Pioneer Square - Ferries, etc. The condo was comfortable and well stocked. Staff were awesome, hand delivering an emergency package I had to have shipped from home. All in all, highly recommend.